Our Committee were chatting and one member said, "why don't we share this?" I thought about this a bit, as I know that followers sometimes don't like the bad news, or rather, sad stories, but this IS our work, and OUR life; it is what we do. It’s not all cute fluffy cuddly cats: it is also poorly cats, abandoned cats, orphans with no mum to care for them. So here we go... warts and all. Tico and Poppy that are reserved today were from a litter of 5 that we took in from another rescue charity as they could not take them. The kittens were only a week old and in a bad place; at a farm, no sign of mum, but a fox had been on the go, and all involved were very concerned for the wee ones safety. Mum had not been seen for over a day, the kits were starving, they were at a spot that had a massive drop behind it, if they moved... well, enough said. So late at night, the other rescue charity turned up at mine with them and they were distributed for hand rearing. Then we have Mama, who was in a very bad situation, semi-feral it seemed, but really there was a nice cat inside, but she was heavily pregnant. Mama had 7 kittens, one passed away last week, it couldn't digest food and was not thriving. The other six are now 7 weeks old today. We also have at the moment, Baby B, as I call him. Baby B is the double of my Bailey, hence Baby B. He is now 7 weeks old, his two siblings didn't make it as they were very sick and kept fitting (as did Baby B - one night he collapsed, limp, eyes open - lights on but nobody home, sitting with him until the early hours rubbing him and finally he sprang back to life! Baby B is on antibiotics, still very small but he's a wee fighter, growing, eating, playing, but I’m watching him very, very carefully. We have Stinker the Tinker, who was found in a yard at Dyce, no mum, 2 weeks old, so bottle fed. Stinker was unwell and diagnosed with a bacterial infection in the gut, so on medicine to treat it. All seems well so far so awaiting the next poo sample result! And then Harry (as in Dirty Harry) who never knew how to clean his backside – gads! 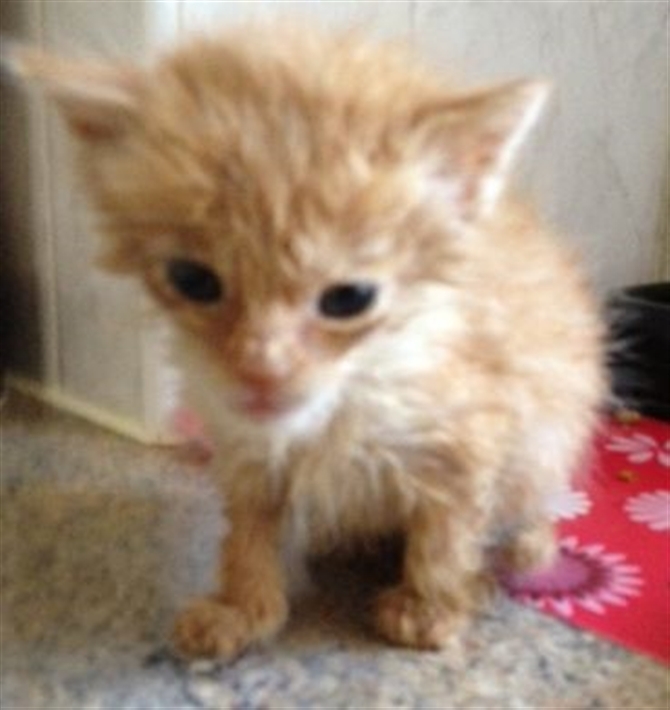 But he’s lovely is Harry, now 8 weeks old, was severely underweight and dehydrated but now bouncing. Oh, and the brood of six, who are six weeks old and still being bottle fed, arrghhhhh. Whiskey is still in foster care and not for rehoming due to his horrible mess on his head, but he will be fine and once his head heals he will be looking for a new home, he’s just adorable is Whiskey. This IS the real life of us volunteers, people see the cats for rehoming, but they don't see what goes on in the background. So when you call to speak to someone and we don't get back immediately or answer, just consider the above, the phone rings, you are sitting with a poorly puss, what is the priority? I would say... let it go to voicemail. On a brighter note, of the ones picked up from Expro at barely 2 weeks old, one was very poorly, little Snookums, I so worried about that wee man; every morning would get up and scared to check on him. His siblings were thriving but he wasn’t. Sandy (vet) said he wouldn’t make it, and although I said to him, nah, he’ll be fine, deep down I agreed with him, but, well, let’s give the wee guy a chance. He would slowly walk to the bowl for food, nibble then go back to bed, head down. Kept telling him, c’mon you, we can do this. Pic of him below, he looked just awful, so you can see how Sandy and secretly myself thought he wouldn’t live... and a pic of him the night he left me. He went to a new home a wee while back. They met him and his siblings and wanted him. He could have gone, but nope, you can’t have him for another 2 weeks, me being funny maybe, but being cautious. So below, a message on facebook tonight... so, so chuffed. My wee poorly Snookie... what a handsome lad he’s become.